This release will upgrade your Tekla Structural Designer installation to version number 18.0.3.12 and should be installed to ensure optimum function of the program. It includes a number of enhancements and issue resolutions as detailed below. Installation - this service pack requires Tekla Structural Designer 2018 to be installed and will upgrade this to version 18.0.3.12. Where an Autosave file exists, the top option will be available and is the recommended choice. If a previously saved version of the file exists, the second option will be available (whether or not an Autosave file exists) listing the last previous save of the model. This is the recommended choice if no Autosave file exists. If there is a preferred previous file version the engineer wishes to revert to, this can be selected via the option “Open another model”. If the model has only just been started, then none of the above scenarios apply and so the remaining option “Start model again” is the recommended choice. There is a final option to save the possibly corrupted model for submission to your local Support Team for investigation. We would be most grateful if engineers could use this option to help us with continuing to improve the program. When submitting such a file, please try and include as much information as possible about the steps undertaken in the program just prior to the error. Editing - Piled Mat Foundations - when a Foundation mat slab with piles was moved, by either of the Edit > Move or Edit > Move Model operations, the associated piles did not correctly move together with the slab item (TSD-1731). Bearing Walls - the formulation of the underlying analysis model for bearing walls is improved the prevent the creation of very short analysis elements for the circumstance of very short walls/panels and walls with several panels of varying heights (146821, 55011). Seismic Wizard - improvements are made to the automatic selection of the number of stories value in the Seismic Wizard; only levels above that set in the Wizard for the “Ignore seismic in floor…” are included in the floor count and the bottom level is excluded even when set as a Floor (in Construction Levels dialog) and not set as ignored. It is noted that the automatically selected value can be edited and should be considered a default only, subject to review/ correction by the engineer as appropriate (TSD-2031). Diaphragms - the analysis model diaphragms were not automatically updated when new slab items were added to a model. This could cause problems with validation that detected the presence of required diaphragms, such as that for Simple Wind loading, causing analysis to be prevented until the validation issue was resolved. The issue could be worked around by checking off and on the “include in diaphragm” setting for any single slab item to update the solver model. This workaround is no longer required. This issue applies only to Tekla Structural Designer 2018 Service Pack 1 (version 18.0.1.1) in which it was introduced (TSD-3901). Graphical Results - Vibration Analysis - when viewing a graphical mode shape, the tooltip information now displays relative displacement values for translation and rotation. Previously the tooltip gave only translation values and incorrectly included units. For more information on modal displacements please see this TUA Article (TSD-3981). Concrete Design - Reinforcement - a new warning is now issued in the Process Window when a model is opened containing reinforcement grades and/or sizes which are not stored in the Materials Database. In order to design the model it is then necessary to add these to the database via Home > Materials > Model (TSD-2451). Beams - Deflection - an incorrect deflection failure could be reported for beams with camber applied for combinations including snow load cases but to which no snow loading was actually applied. Deflection checks are improved to cater for this rare, but possible, circumstance (TSD-4581). Design Concrete - an error which caused the program to close could occur when running Concrete Design in models containing semi-rigid diaphragms (SRD). This was due to an issue with SRD meshing during the concurrent chasedown analyses run during the design process. This could be prevented by checking off the “Run chase-downs concurrently” setting in Home > Settings > Design Options > General. This workaround is no longer required. 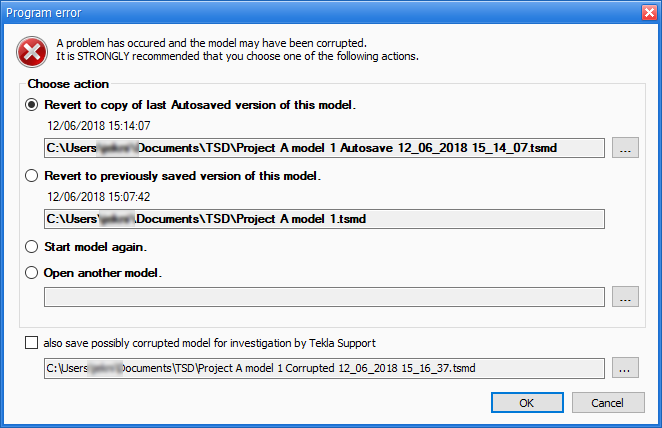 This issue relates only to Tekla Structural Designer 2018 first release (version 18.0.0.33), in which the concurrent chase-down analyses feature was was introduced, and subsequent service packs (TSD-2911). Punching Shear - Columns - the calculation of the loaded perimeter length for Trapezium section columns is corrected (TSD-1631). Design Options - new default values are added to Concrete Design Options for Finland, Norway and Sweden, principally for bar sizes and reinforcement ratios for columns and walls. The relevant settings are found in Design Options > Concrete > Column > Reinforcement Layout and ...Wall > Reinforcement Layout. (TSD-3641). The new defaults can be loaded into existing models by; first ensuring the correct country code is set in Model Settings > Design Codes > Head Code, then clicking the [Load…] button in Design > Design Options. Design Calculations - Columns and Walls - the maximum amount of longitudinal reinforcement allowed in design for columns and walls is no longer fixed to the recommended values in EN 1992 cl. 9.5.2(3). This is more in line with the recommendation which allows for exceptions in cases where "the integrity of concrete is not affected", allowing the engineer to control the maximum column reinforcement ratio through Design Options. The change applies to design to all supported National Annexes of the Eurocode (TSD-3641). Steel Design - Beams - Torsion - a Beyond Scope status is now issued for the Inherent Torque check when either end of an open section beam (which is subject to torsion) is torsionally released, since the design assumption is torsional fixity at both ends (TSD-1881). Isolated Foundations - Pile Caps - One-way Shear Check - following the recommendations of the CRSI Design Guide, the upper limit on the maximum distance from the pile face to the critical section is now set to 13" where formerly it was set = the effective depth always (TSD-1971). Nodal Deflections - a new Settings option is added to this report item allowing specification of either Strength of Service Combination factors for the output (TSD-2261). Solver Model Data - Nodes - model filters were not correctly applied to the Analysis > Nodes report item (TSD-4561). The report item was not populated unless the members in design groups were set to Auto-design on (TSD-3131). Note also that the report did not contain the correctly identified critical beams for each group due to the issue noted above in the Design > General section (TSD-3401).